Cubanelle peppers are a common pepper used in Puerto Rican, Dominican and Cuban cuisine. It has several names in Spanish; ají cubanela in the Dominican Republic, with "ají" being another word for pepper in Spanish (Figure 1), pimienta de cocinar (translated to “pepper for cooking”) in Puerto Rico (Figure 2), and ají chay in Cuba (Figure 3). 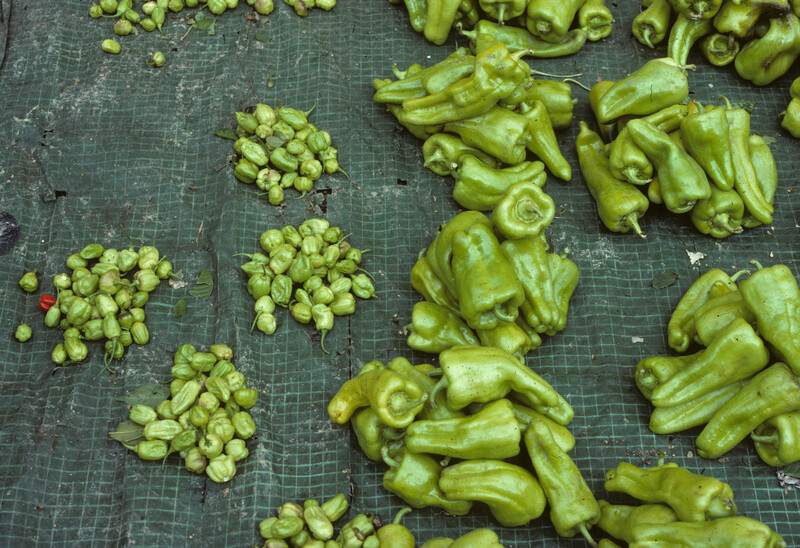 Ají chay was the most common pepper found in three markets in Havana over a one year period, second only to bell peppers, and significatly more often than ají cachucha (Shagarsodsky, et al. 2013) . 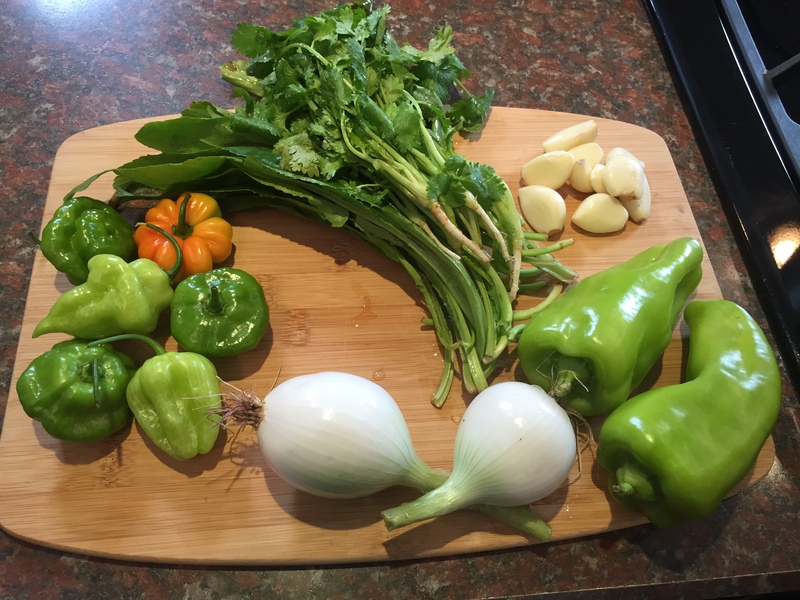 (Frank Mangan visited over 30 markets in several cities in Cuba duing two visits in 2016 and saw "ají chaya" in only one market, while bell peppers (FIgure 4) and ají cachcuha peppers were very commmon. Cubanelle peppers are also used for stuffing different ingredients (Figure 5). Cubanelle peppers are also known as Italian frying peppers. Their thin walls and sweetness, which is brought up by frying, is a staple at Italian fairs (Bray, M.). Cubanelle peppers is one of the traditional ingredients of sofrito (Figure 6) along with another pepper ají dulce. Given the extensive use of sofrito in Puerto Rican, Dominican and Cuban cuisine, cubanelle peppers are staples in markets in these countries (Figure 7). Cubanelle peppers can be slightly hot, with scoville units between 500 and 1,000 (Bray, M.), which is very mild considering that jalapeno peppers average 3,000 scoville unites and habanero peppers are over 200,000. The walls of cubanelle peppers are much thinner than bell peppers, and thus weigh much less per volume than bell peppers; this means that a bushel box of cubanelle peppers will weigh less than a bushel of bell peppers. It is interesting to note that both Cubanelle peppers and ají dulce peppers are the same color, light green. It could be that Cubanelle peppers were choesen due to their similarity to the color of ají dulce, and also due to the fact that both can be slightly spicy (Figure 8). Cubanelle pepeprs are the same genus and species as bellw pppers and many other peppers grown in the Northeastern United States, Capsicum annuum, so the the same production practices can be used. Transplants do not have to be started earlier as is the case with ají dulce. In 2015, we grew the cubanelle type "biscayne" at the UMass Research Farm to evaluate production and market acceptance. Plants werre set at 1' in the row with two rows in raised beds covered with degradable plastic, giveing a plant popualtion of 14,400 plants per acre. The harvest began in mide July and went till frost, whihc occurred on October 14 (Figure 9) (Figur 10). For information on production and management of Cubanelle peppers, refer to the New England Vegetable Management Guide and click on "pepper". In 2015, we grew the variety "Biscayne", a Cubanelle type that was readily-available from traditional seed companies and readily-accepted by Latino markets (Figure 11). Cubanelle peppers should be washed in chlorinated water if they are dirty from contact by soil in the field. Cubanelle peppers being washed in a vegetable washer at the UMass Research Farm. Cubanelle peppers are traditionally packed in bushel 1/9 waxed boxes.